Cities are facing major challenges and the expansion of citizen participation has been considered a valuable strategy. Citizen participation experiences supported by information and communication technologies (ICT), the so-called eParticipation, have taken hold in cities around the world. In this chapter, we discuss some of the enabling and inhibiting elements for the creation of virtual spaces for participation by governments in a developing country of Latin America—Brazil. A list of enabling and inhibiting elements grouped in five dimensions was produced from a survey with Brazilian experts, including public officials, academic researchers, and consultants involved with the implementation of eDemocracy projects. To contribute to smart city initiatives in developing countries, interviews were made with the chief information officers (CIOs) of four major cities in Brazil—Rio de Janeiro, Porto Alegre, Curitiba, and Campinas. We found out that the enablers are concentrated in the sociocultural and technological dimensions, while the inhibitors are mainly in the political and governance dimensions. The enabling elements are, for the most part, external to the sphere of action of city information and communication technologies (ICT) managers. As far as inhibiting elements are concerned, even though they pose broad challenges that may be perceived to be beyond the reach of the leaders of eParticipation initiatives, there is more scope for managerial action. ITU—International Telecommunication Unit. (2013). Measuring the information society. www.itu.int/en/ITU-D/Statistics/Documents/publications/mis2013/MIS2013_without_Annex_4.pdf. Accessed 5 March 2014. Kanter, R. M., & Litow, S. S. (2009). 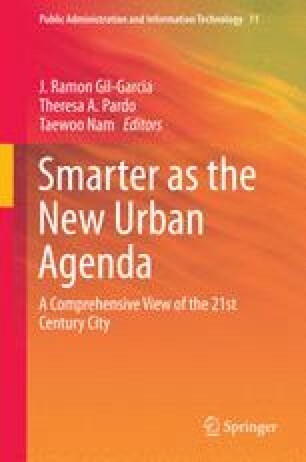 Informed and interconnected: A manifesto for smarter cities. Harvard Business School General Management Unit Working Paper, 9–141. www.hbs.edu/faculty/Publication%20Files/09-141.pdf.Accessed 17 March 2014. Madrid. (2004). Reglamento orgánico de participación ciudadana del Ayuntamiento de Madrid. www.munimadrid.es/portales/munimadrid/es/Inicio/El-Ayuntamiento/Participacion-ciudadana/ANM-2004-22-Reglamento-Organico-de-Participacion-Ciudadana-del-Ayuntamiento-de-Madrid?vgnextfmt=default&vgnextoid=b5117b3cb0e4f010VgnVCM1000009b25680aRCRD&vgnextchannel=8449e3d5d3e07010VgnVCM100000dc0ca8c0RCRD&idSubPage=1.Accessed 7 March 2010.